Earlier this morning, photographers Matt Stroshane and Ali Nasser snapped the first shots of the Casey Jr. Splash ‘N’ Soak Station – the latest offering to debut in New Fantasyland at Magic Kingdom Park. 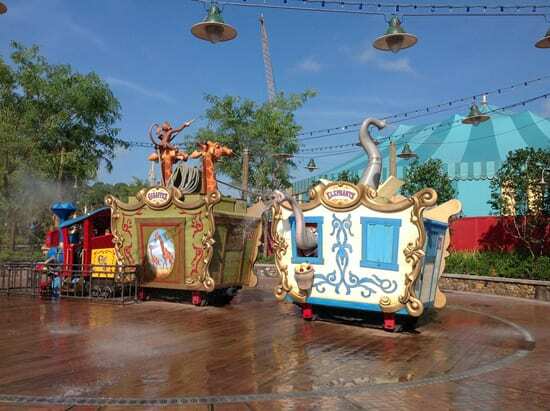 This attraction plays an important part in the theming of the Storybook Circus area of New Fantasyland. 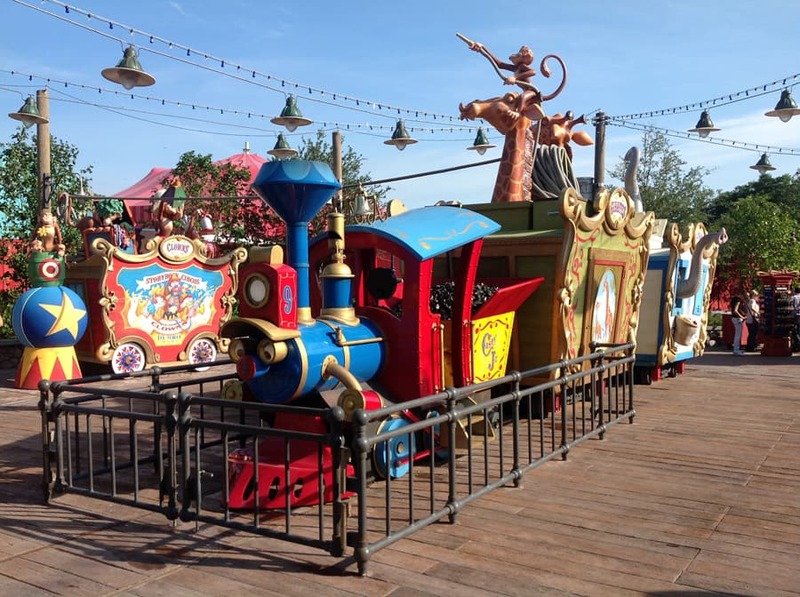 According to the area’s storyline, this famous locomotive from “Dumbo” has rolled into town and brought the circus with him. 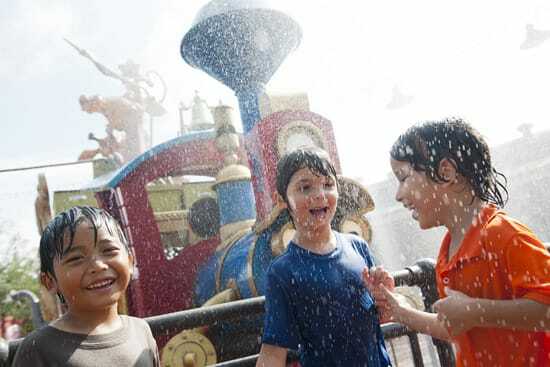 Now, in addition to flying with Dumbo and soaring with the Great Goofini on the Barnstormer, guests can cool off with Casey Jr., who can be found near the Fantasyland train station getting splashed by a colorful crowd of circus animals, including monkeys, elephants and giraffes. 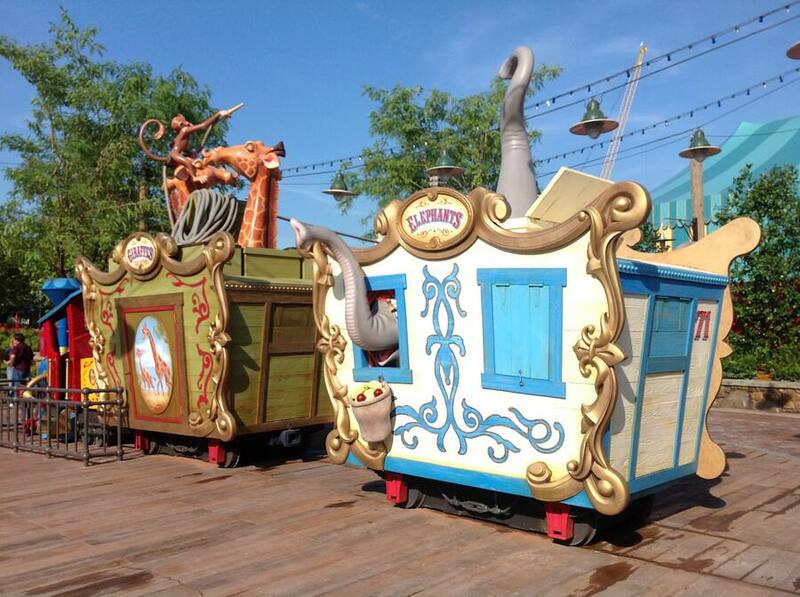 Also beginning today, Magic Kingdom Park guests can spy both sides of the “doubled” Dumbo the Flying Elephant. The construction walls were removed earlier this morning to reveal what the enhanced attraction will look like. The “new” side of Dumbo the Flying Elephant and it’s interactive Big Top queue area will officially open to guests in July. We’ll be there on July 31st. What parts of the new Fantasyland will be open then? thanks for posting the pictures of NewFantasyland, I live in Brazil in Sao Paulo next year will be there, not see the time when going inaugurated entire NewFantasyland? Love everything but the fence, is the fence permanent? Please tell me its not. Really glad to see this. And the que area play land, too. I think, on previous visits, “squirty place” has been my nephew’s favorite place in the whole park. I rather liked the foam-rubber flooring material at Ariel’s Grotto. Thought whoever had invented that deserved a medal, or something. This looks awesome! My kids will love it this fall when we are there. Im also excited to not have to wait in line for Dumbo! The new indoor play area while you wait is such a smart idea. Can’t wait! Love, love, love it!! We will be there with our 3 children in 17 days… and the best part is, they have no idea! They will have a blast in the water. Don’t forget their swimsuits/change of clothes! Please pass these comments on to the Imagineers from the little focus group that is my family. I have two grown children and no grands yet, but I am auntie to many little kids and Disney is a favorite topic around our kitchen table. When we first heard about a Circus Area in the new expansion, we all thought “Meh”. We were not excited at all and we thought it would be a throwaway, somewhat boring area like the Mickey’s Toontown Fair was. I want to be the first to admit here how wrong I was — because the Imagineers have TRULY outdone themselves. This is just spectacular. That actually needs to be in all-caps as SPECTACULAR. These pictures really make it feel like the circus has just rolled into town. 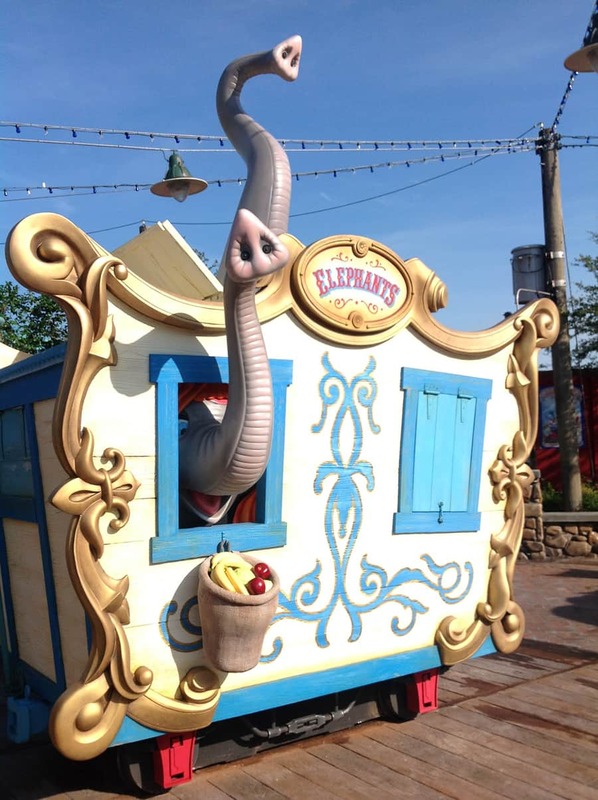 And I never thought about Dumbo being actually set in Florida, but boy does this all make a lot of sense now…it’s really like the Dumbo circus has rolled into town and stopped just outside the Fantasyland Forest. Everyone is so excited to come to WDW and be part of this new circus. 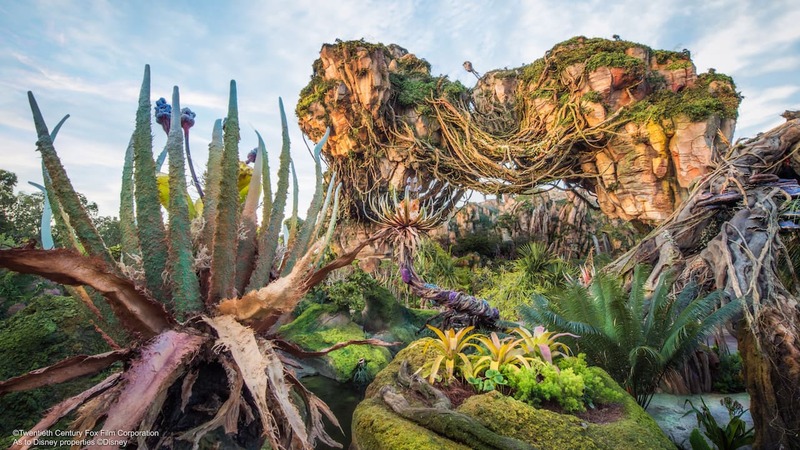 Please communicate to all the Imagineers how excited everyone is and tell them that they have managed to make what was at first thought to be a second-tier and lackluster idea into a SPECTACULAR one. Don’t forget to use all-caps too! I will pass this on. Thank you! What the photos don’t show is that some of these animals are animated – the giraffes’ heads and some elephant trunks move so that kids on both sides are squirted. With the movements and the water blasting, it truly feels as if you’ve just walked in on a circus that’s just arrived and the animals are thrilled to cool down! I like the train but the gate around the engine to keep children from climbing looks really odd. Any chance you know when in July it will be open? My group will be in Disney from July 8th-14th and it would be great if we could see it! 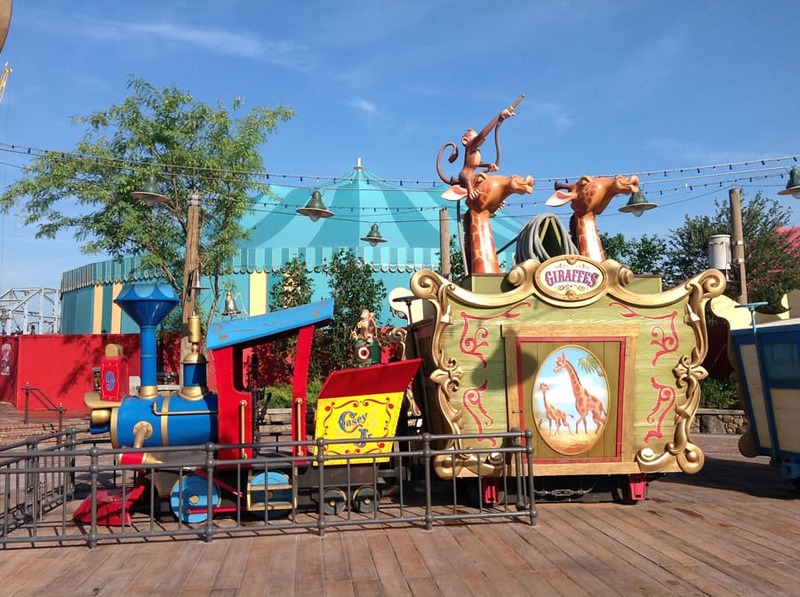 Casey Jr. is open as of today. 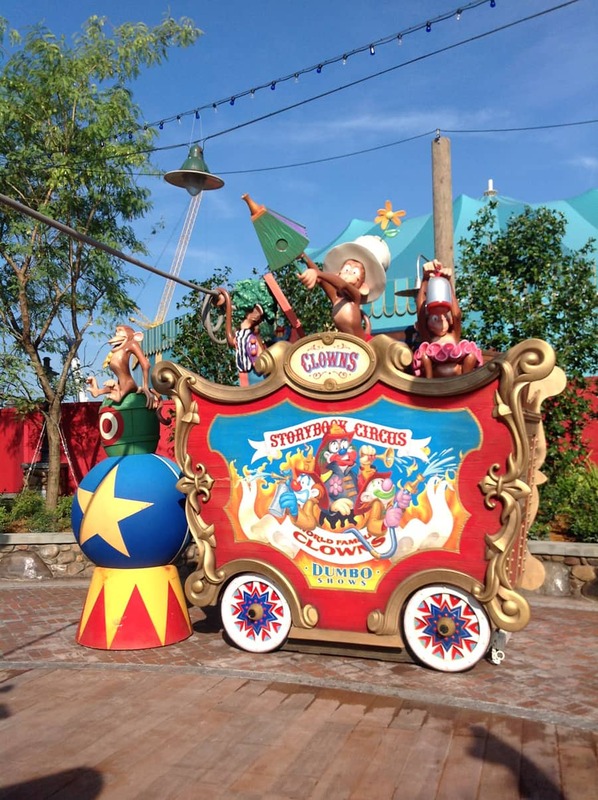 The first half of Dumbo is also open…it’s just the second carousel that opens in July. Any information on when the rest of the Circusland area is going to open? The Big Top gift shop and Pete’s Silly Sideshow? Hello, love this new area and I love the attention to detail in the individual cars in Casey Jr. I was wondering though what the fence is doing here around Casey Jr. Is this going to be open for kids to get up and take pictures inside the engine, or is the fence meant to keep kids out of here completely? Is the gate to control the number of kids in the engine, or block them from getting there at all? You have a lot to look forward to on your next trip! I was out there this morning and the area is changing so quickly! Really – your chances are pretty good. Very cool! 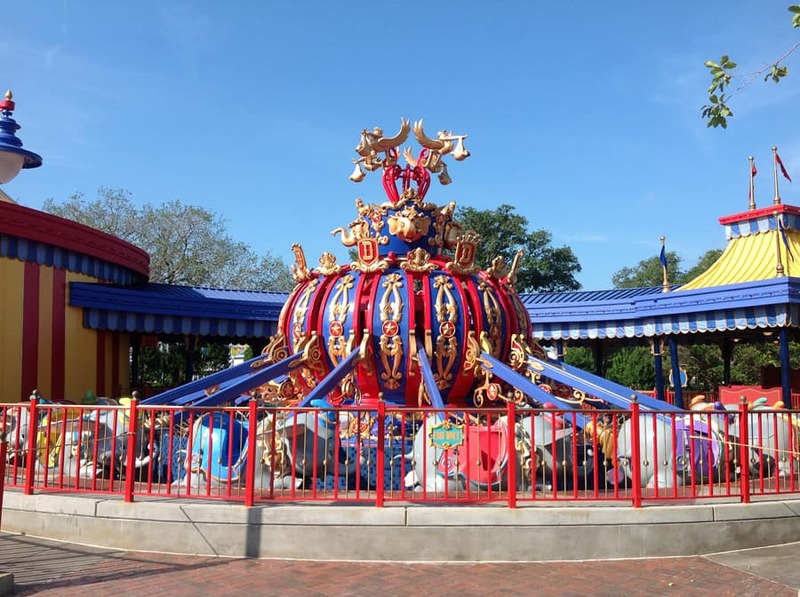 Does this mean soft openings have begun for the second spinner? Chris- It is NOT open at this time. But if you’re a guest in this area, you’ll see it. I have no excuse not to go in the hot months now! Tell me there isnt an age limit! Can’t wait for our visit in March 🙂 This looks GREAT! 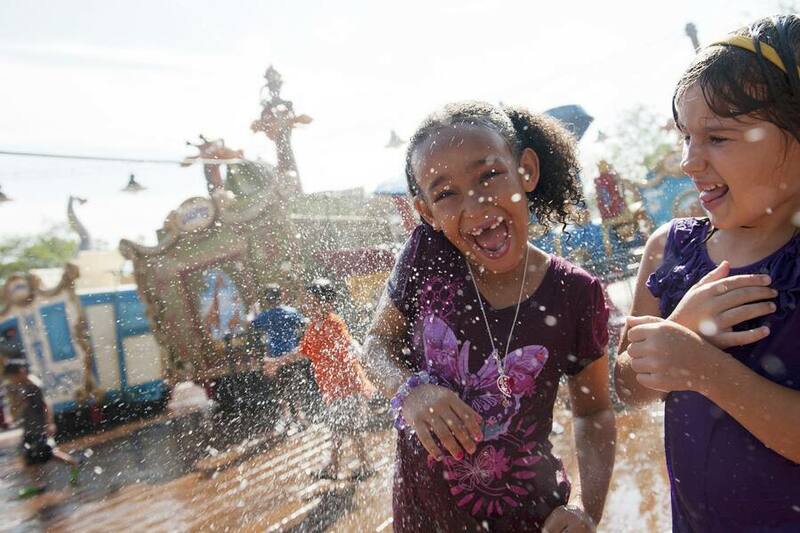 Yes, it’s going to be a great place to cool off! I can tell that this is where my brother, mother, and I will hang out while my sister and father ride the Great Goofini ride. Can’t wait! My brother loves the random water areas throughout the parks. Wow this area is looking great. 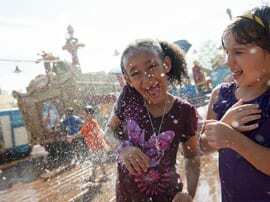 Casey Jr will definitely give some welcome relief to the hot days.